We're onto week six of treatment for Max's acne fulminans. His skin has been looking better, but he's had a few areas flare up once he started to go down on the Prednisone dose 10 days ago. Last week the Prednisone wean was only a little difficult. He had a hard time staying asleep, and was awake a lot during the nights. He had a hard time calming down if he started getting fussy too. We ran into a roadblock at the end of last week in regards to the Isotretinoin (Accutane) treatment. Accutane is no longer sold under that name, instead, all eight generic forms of the medicine are made by just seven manufacturers in the country for the ipledge program. This is a risk management program to keep track of everyone on Isotretinoin. We found out last week that the medicine is all manufactured to be in gelatin capsules. Max is VERY allergic to gelatin. We now have Allergy involved, along with Dermatology, Rheumatology, Gastroenterology, Endocrinology, Metabolics, and his PCP all working together trying to find a solution to this latest problem. We took him in on Sunday to have an X-ray of his spine and pelvis to check for arthritis or bone inflammation - which can be caused by the acne fulminans. The X-rays do not show any signs of arthritis or bone inflammation. X-rays are not very sensitive at picking up these findings (although if the inflammation is longstanding they can see chronic changes sometimes) which is why we will be getting the MRI in the Spring. The good news, of course is that he's not showing signs of arthritis or bone swelling. This means we have likely avoided the long term arthritis treatment for now. 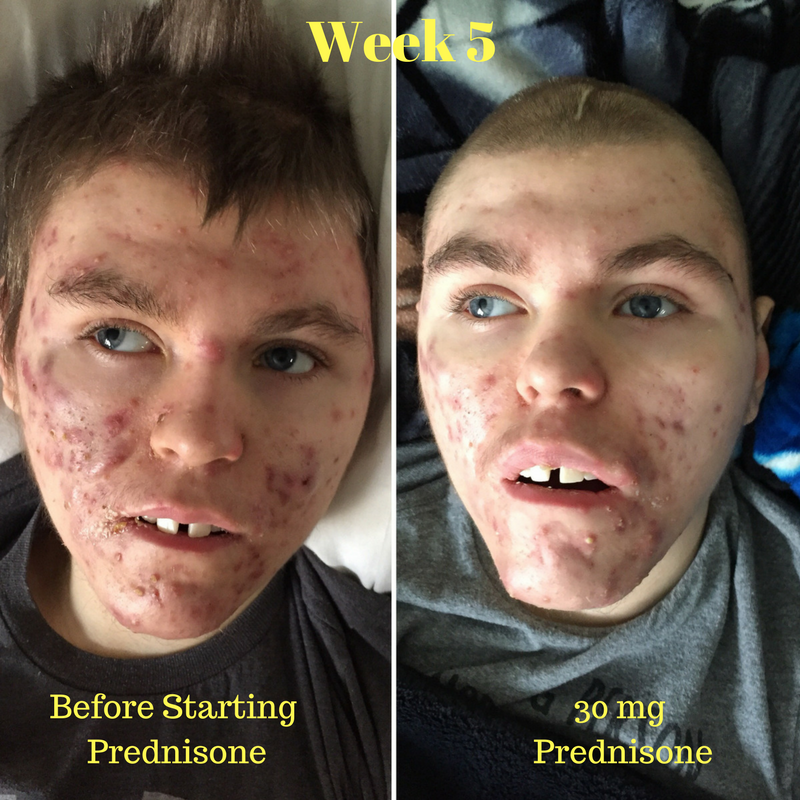 In order to continue the Prednisone wean, until we have a solution to the Isotretinoin solution, Max has been put on a combination of Doxycycline and Adapalene and Benzoyl Peroxide Gel. These are just temporary fixes...and won't cure the acne fulminans. But we have to do something to treat the acne while coming off of the steroid so he doesn't have a huge flare. I've had several friends ask if we would consider medical cbd oil for Max to get through this, and yes - we would and have considered it especially since we have run into a few roadblocks with traditional treatment. However, no one is currently in agreement about how to go about it, as Max's neurologist of the past 15 years has moved to another state. This has left Max without a neurologist who knows anything about him. If we decide to go that route, we'll document it as well. But for now we're doing everything we know to do to help him. Yesterday I was looking for the phone number to one of the clinic nurses who has helped us in the past. I pulled out Max's notebooks to find it. It was in the last book I looked in. I saw my scribbles on the first day he was diagnosed, February 20, 2004. I saw pages and pages and pages of seizure logs. I saw notes from all of his surgeries. I saw notes on metabolic, neurology, eye, ENT, cardiology, orthopedics, urology, dental, endocrinology, nutrition, GI, and pediatrician appointments. I have diagrams drawn by his doctors and notes from nurses written in his books. I looked through every page of those books and saw a history of Max's life. With all of the very rare diseases Max has had, I never thought ACNE would be the one to stump us all the most. I was able to see in his notebooks through the years, we have found a solution to every problem so far, and got we will find a way with this too. You know me. You should just call Realm of Caring and talk to them about trying something and then go get it and try it. I don't think you're going to need guidance from a neurologist with CBD, and the folks at Realm of Caring are pretty incredible. I know of a family whose child has a very rare and devastating skin disorder that is being helped with CBD -- both pain (which is constant) and literal inflammation. The child is not even two years old. If I can do anything to help you, please let me know. I hate to see how much Max is suffering, and I know you can't stay on Prednisone forever.